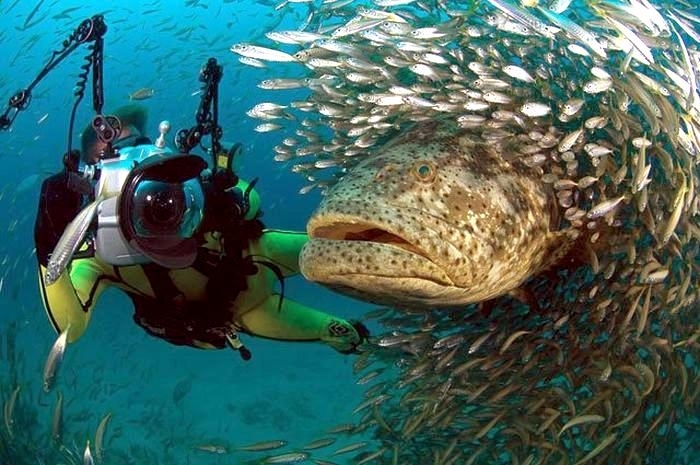 The Giant Grouper is the largest bony fish found in coral reefs. 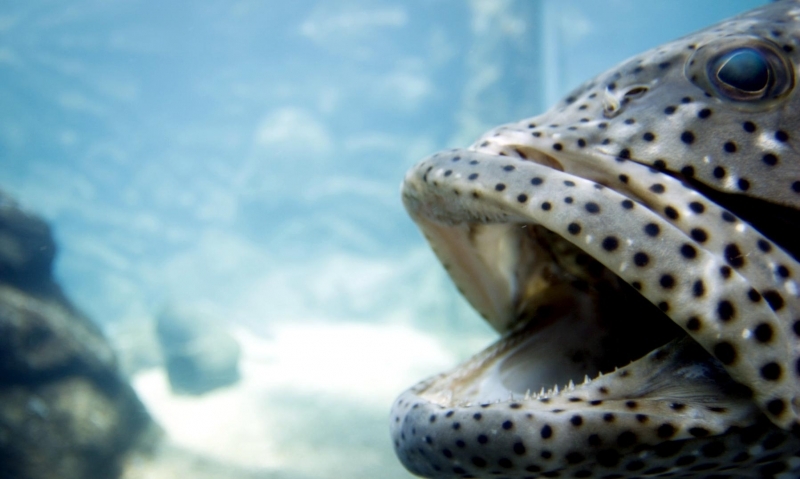 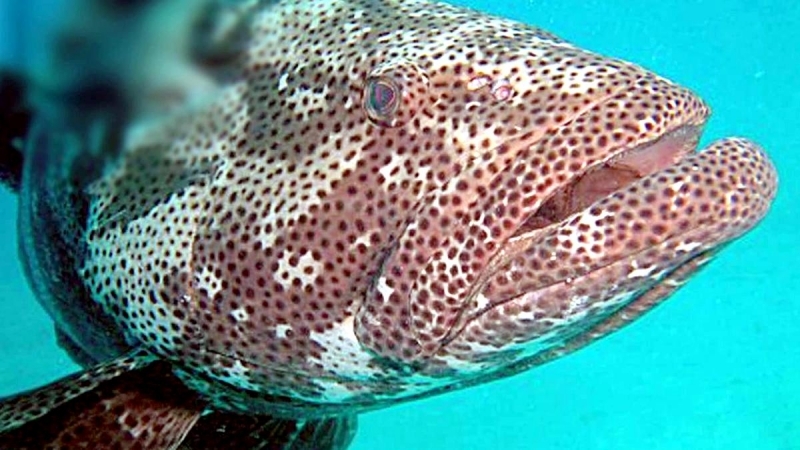 It’s also known as the Brown-spotted Cod and the Queensland Grouper. 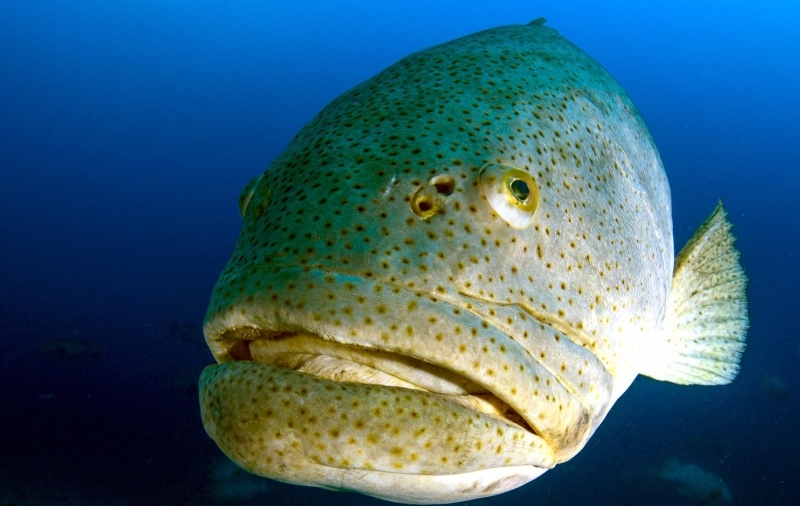 In fact, it is the emblem of the state of Queensland, Australia. 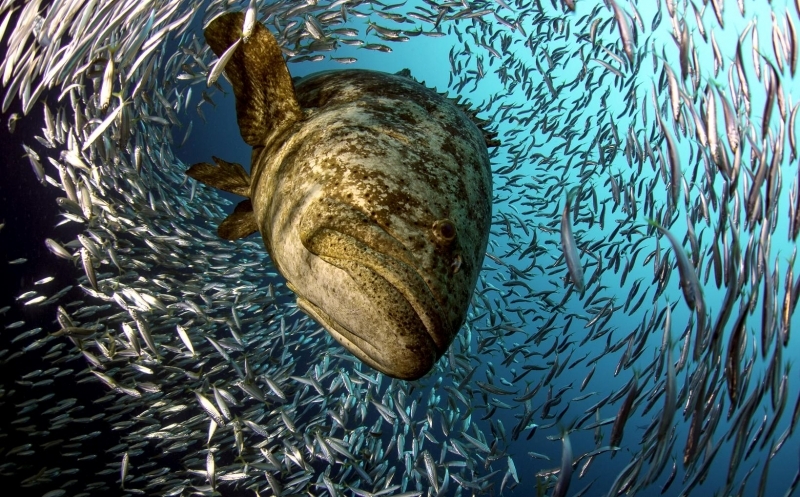 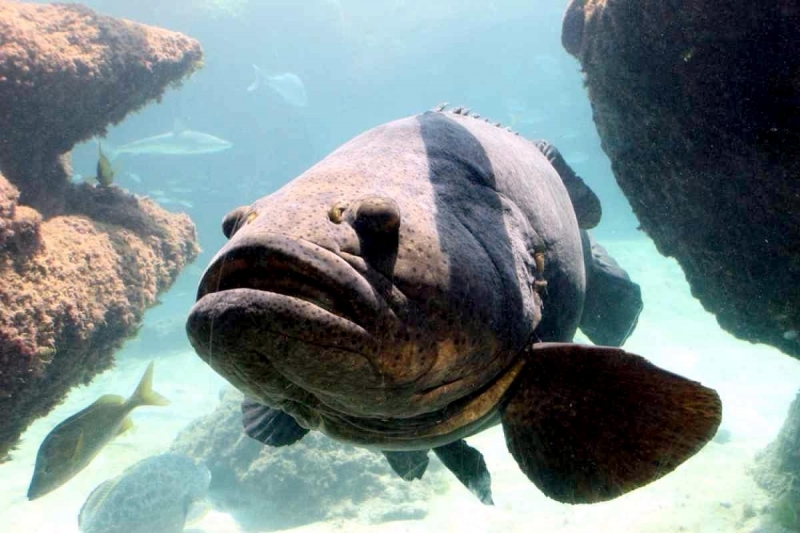 Groupers are a large family of fish and the Giant Grouper is the biggest in the family. 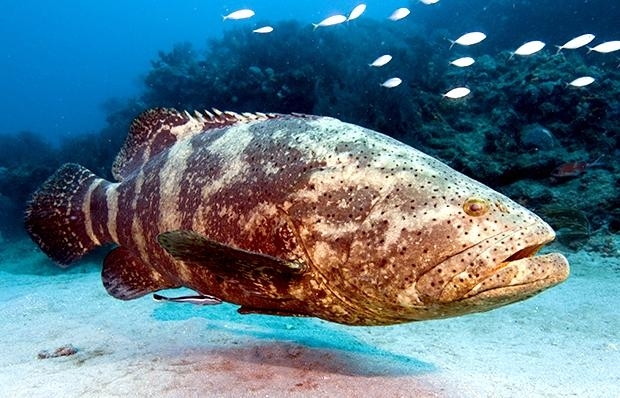 The Giant Grouper is native to the Indian Ocean from the Red Sea to South Africa, eastward to Australia and into the Pacific to the Hawaiian Islands and Pitcairn Island. 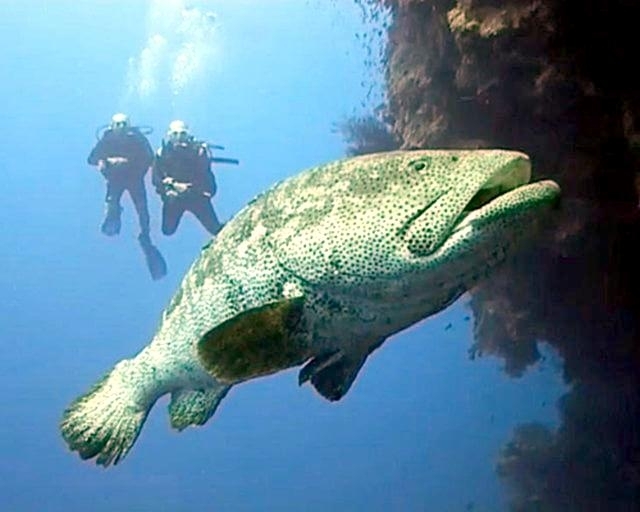 No scuba diver ever forgets an encounter with one of these true giants of the sea that can reach 900 pounds and 9 feet in length. 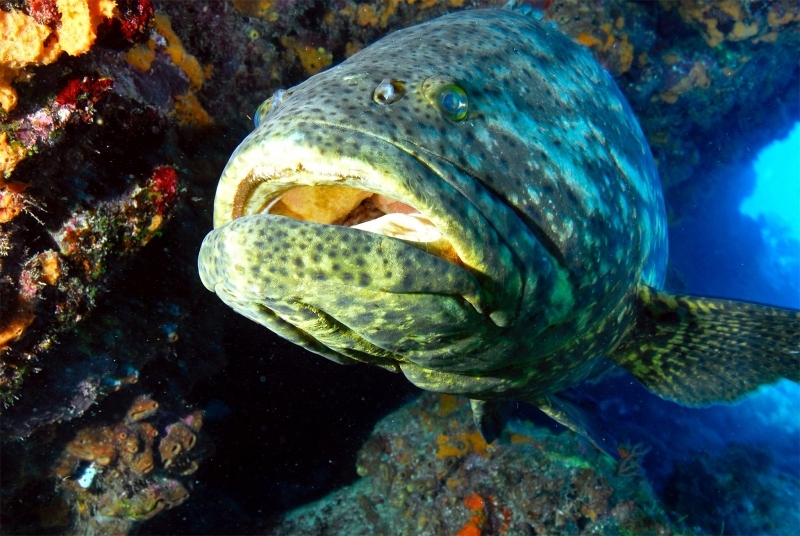 They occur chiefly in coral reef ecosystems at depths from 15 to 300 feet. 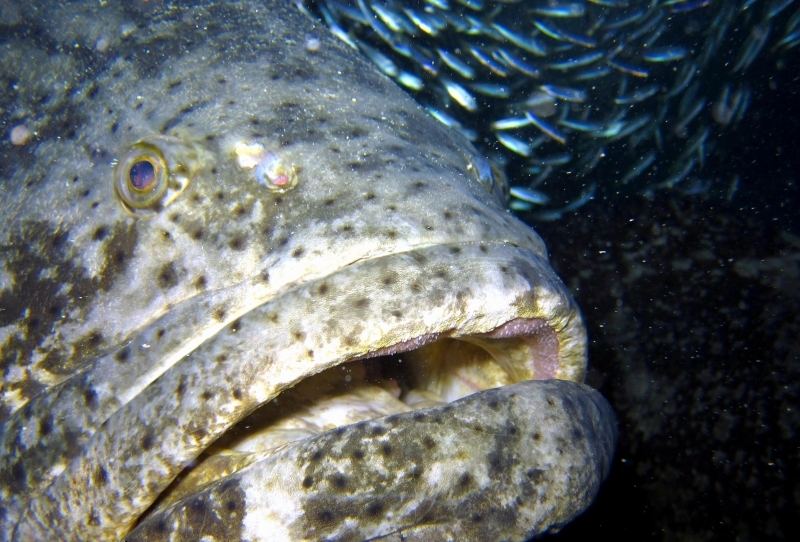 Giant Groupers feed on other inhabitants of reef systems including fish, small sharks, spiny lobsters and other crustaceans. 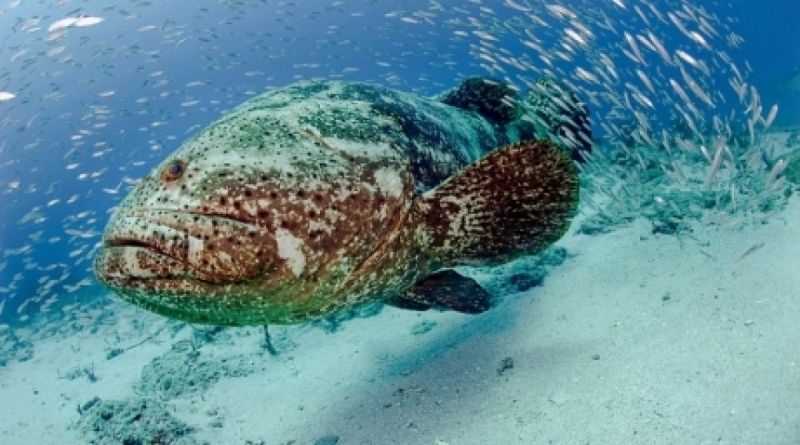 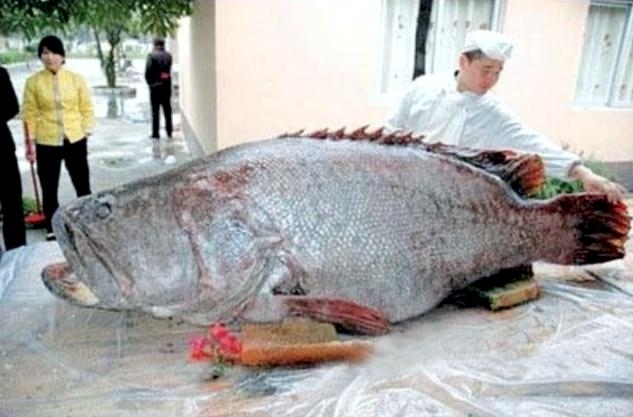 For centuries, Giant Groupers have been an important subsistence & artisanal fishery. 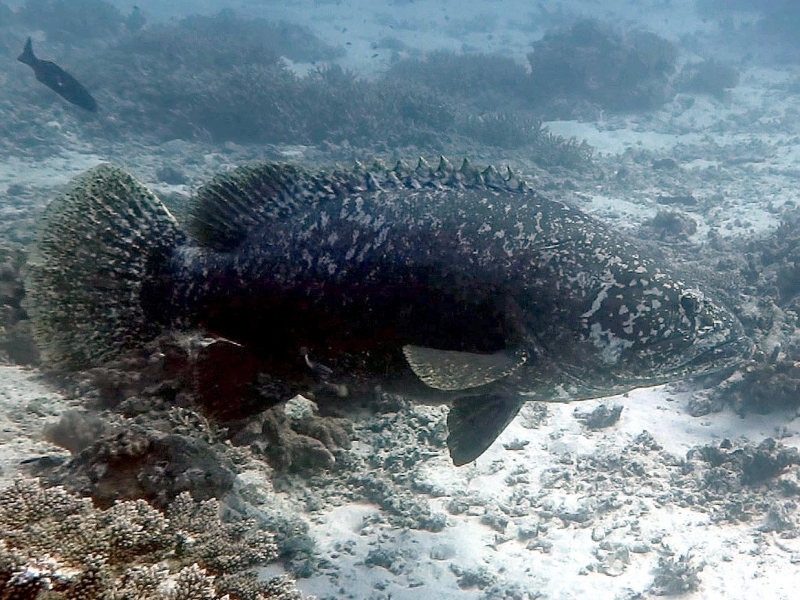 In many parts of their range, Giant Groupers have been wiped out because of cyanide and the use of explosives for fishing on reefs. 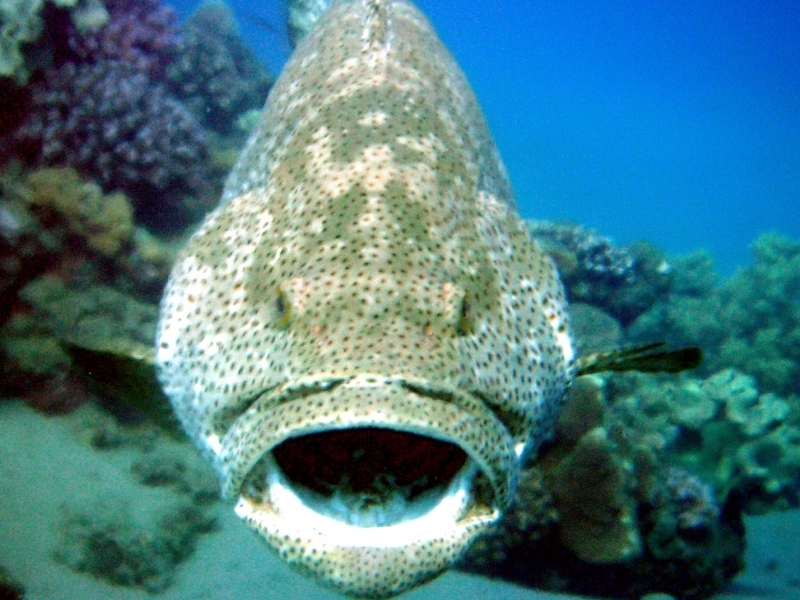 Giant Groupers are found throughout the Indo-Pacific area and throughout reef regions in the Pacific & Atlantic basins. 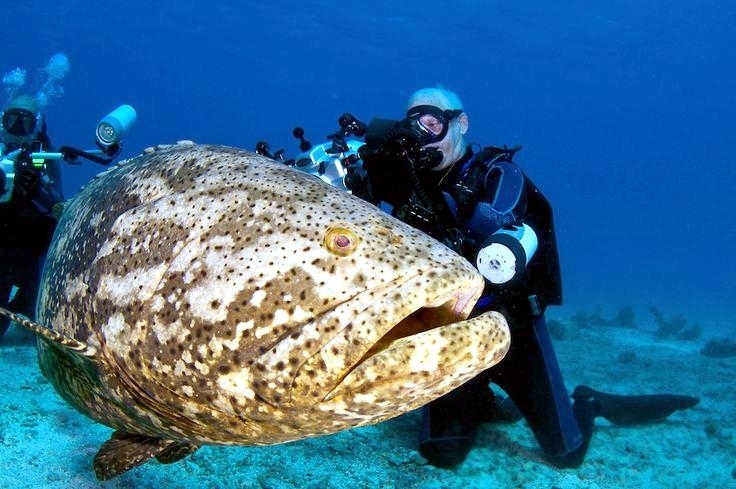 They’re a huge species and can grow as massive as 9 feet (2.7 meters) long and can weigh up to 1,320 pounds (600 kilograms). 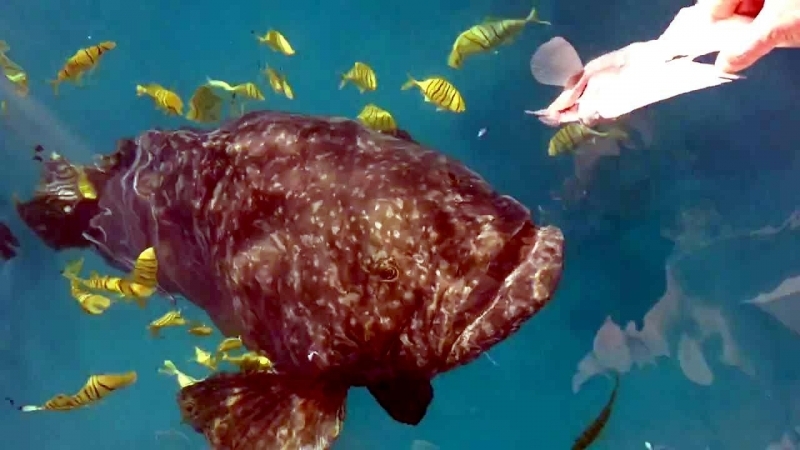 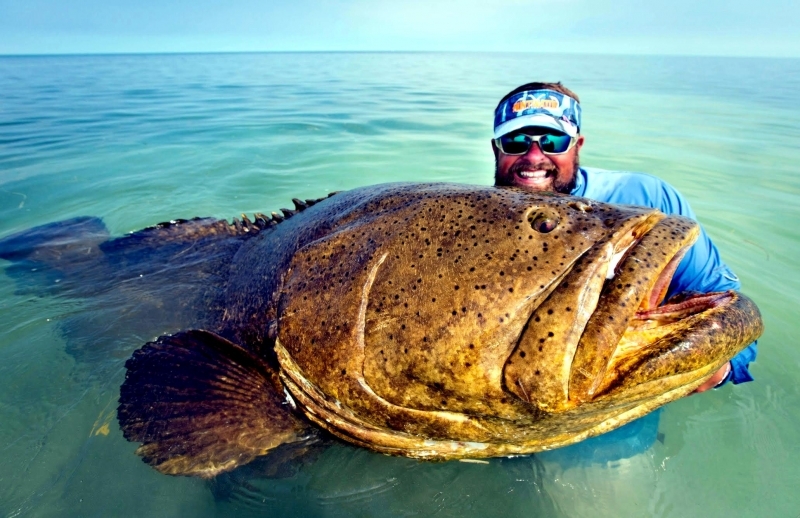 There are rumors that even larger groupers have been found but these are unconfirmed. 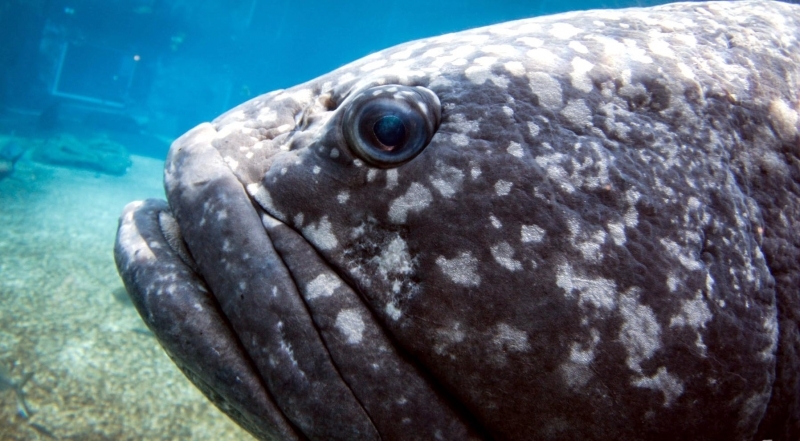 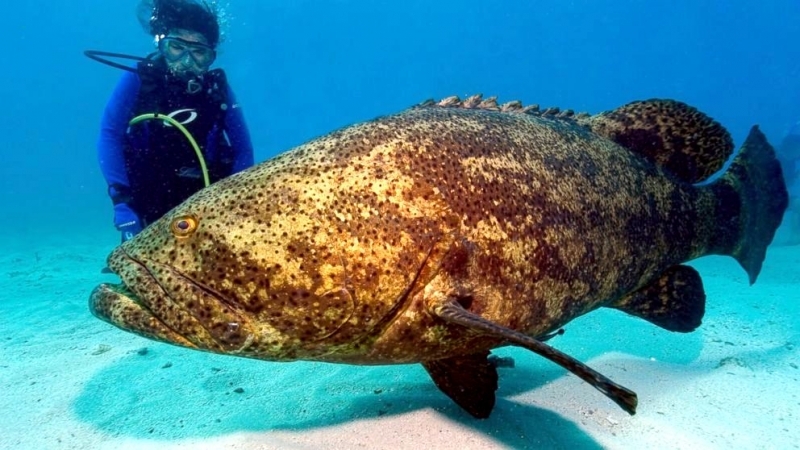 The Giant Grouper is found commonly in shallow waters and feeds on a range of other marine life including small sharks, crustaceans and young sea turtles. 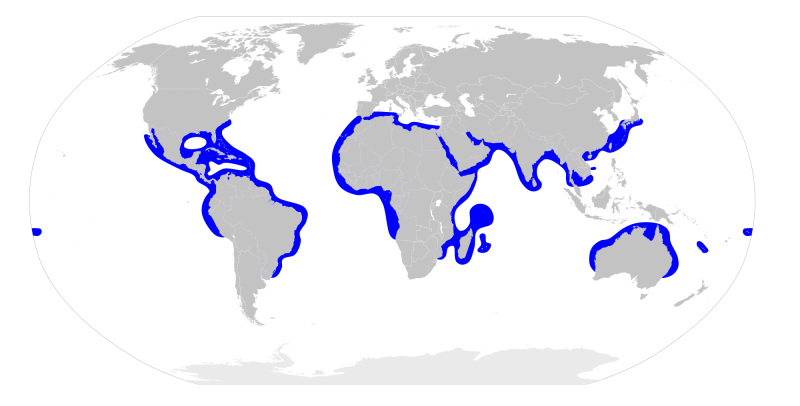 Its favorite sea food is the spiny lobsters. 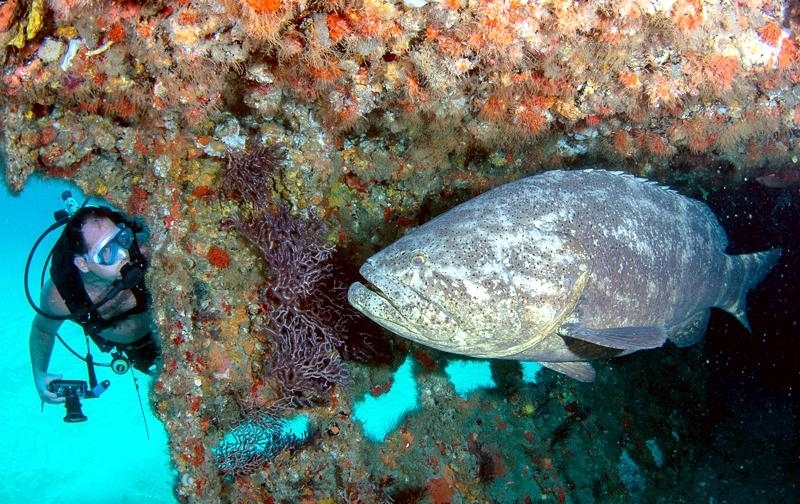 Like other grouper species, it changes color as it ages. 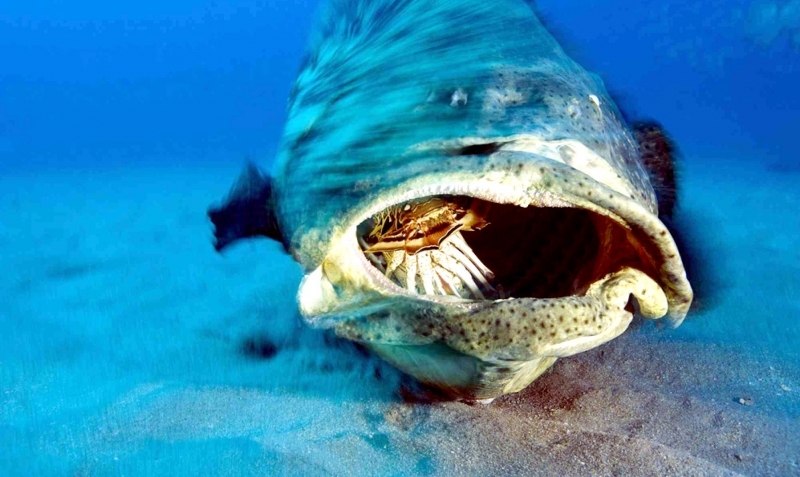 It has an extremely large mouth and a round tail. 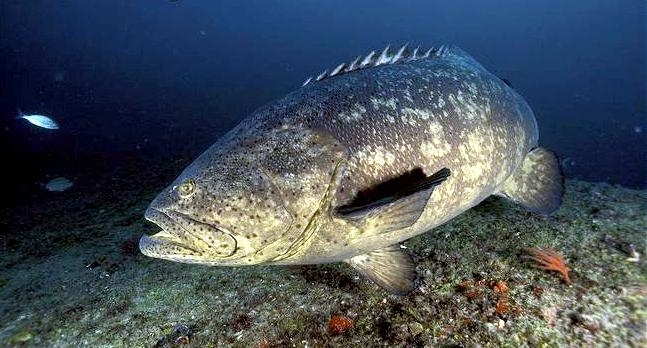 The young have uneven yellow & black markings whereas the adults are green, brown or gray with only a faint mottling. 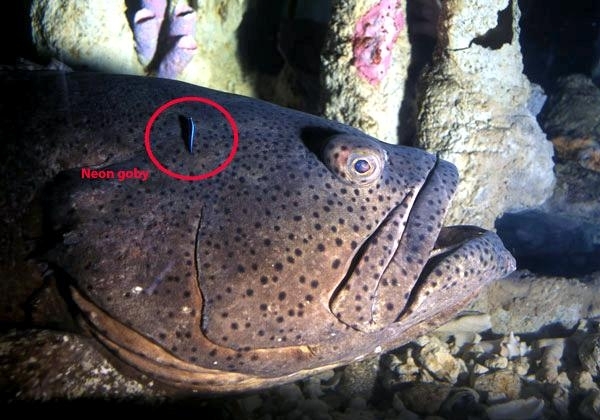 They also have a scattering of black spots on their fins. 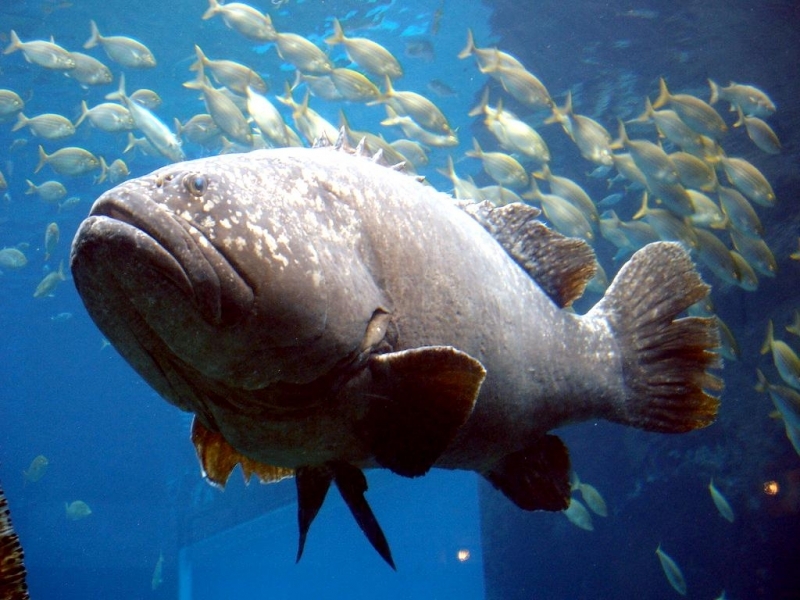 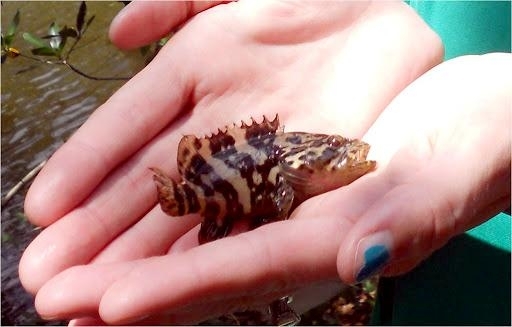 They breed between May & August and like many other fish they are hermaphrodites. 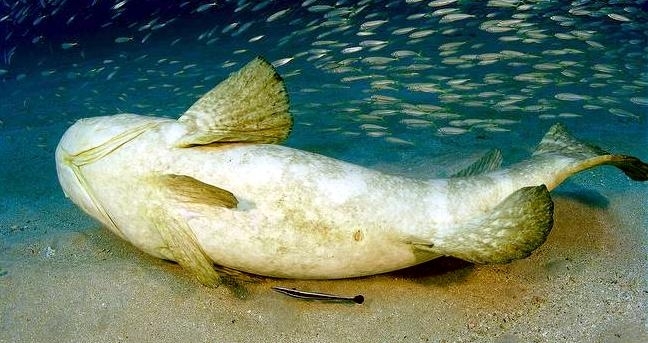 They are a specific type of hermaphrodite known as the protogynous hermaphrodite meaning the young are predominantly female but turn into males as they develop. 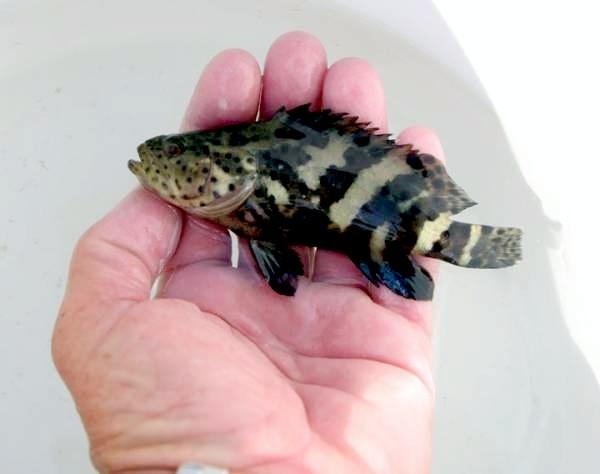 When young they’re believed to grow over 2 pounds (1 kilogram) a year. 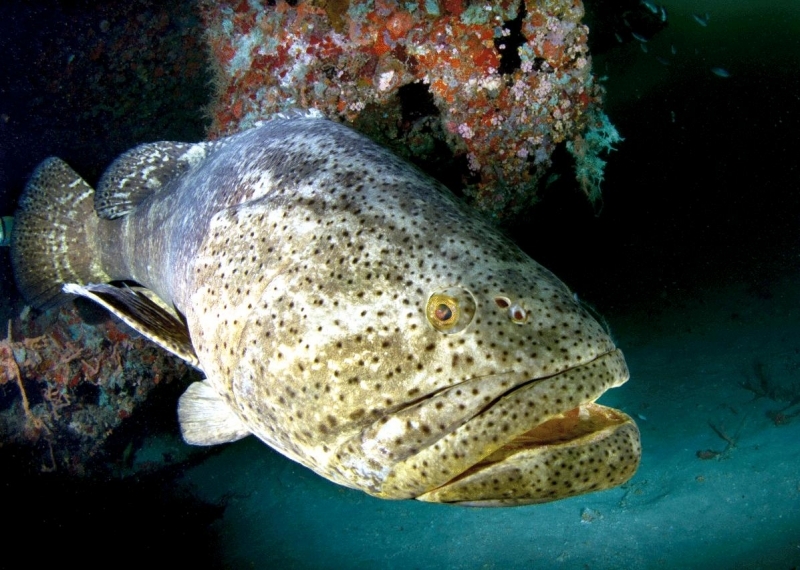 Young Giant Groupers are yellow with black markings, but their color changes to a duller green-gray or brown when they get older. 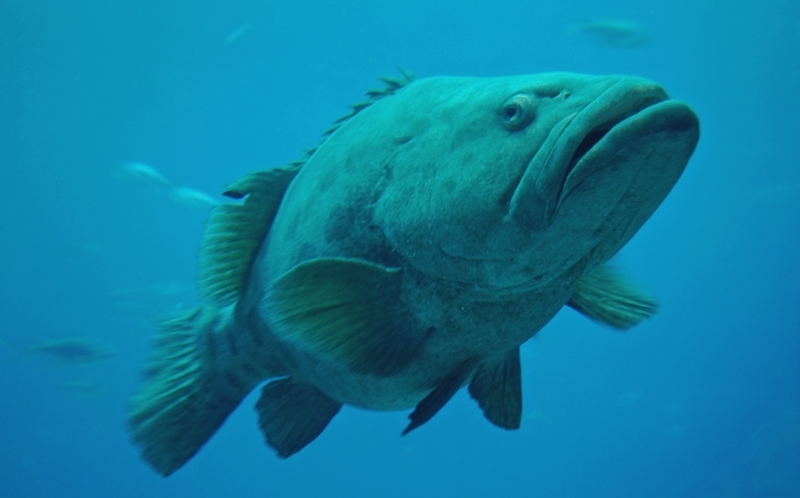 They can live for up to 50 years which is very old for a fish. 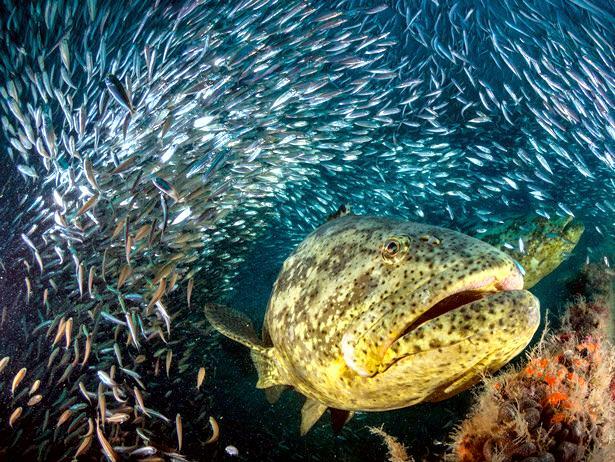 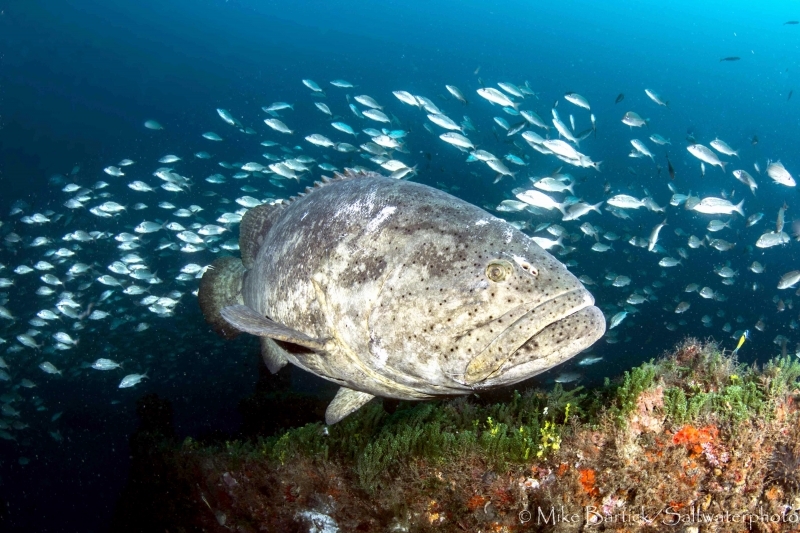 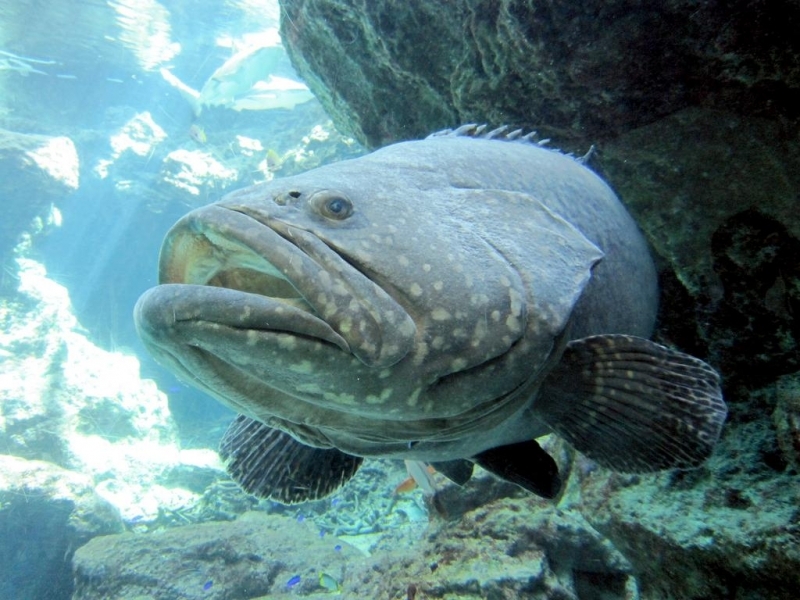 When they reach around 22 pounds (10 kilograms) they turn male and the male grouper has a harem of up to 15 females. 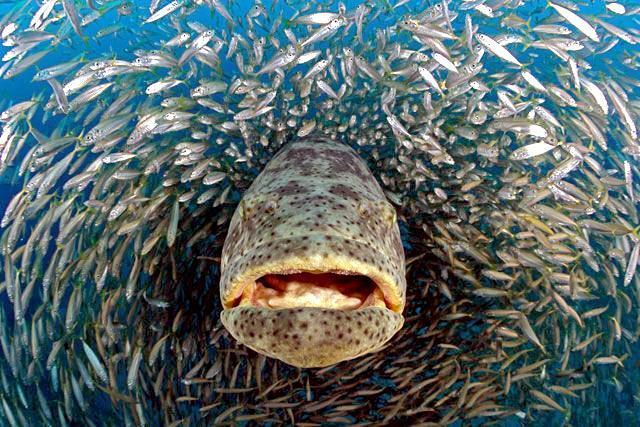 They live in small groups, with 1 male and a harem of females. 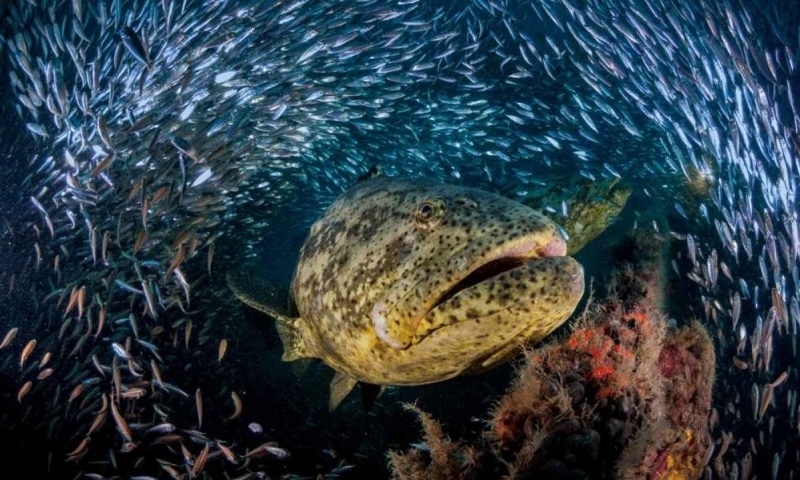 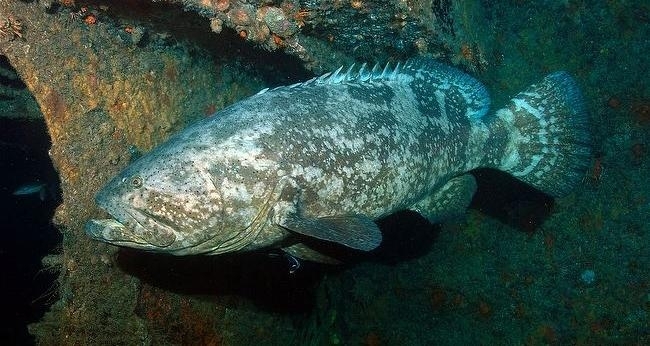 One of the weirdest facts about the Giant Grouper is if the male dies, one of the females is able to turn into a male and take over the harem. 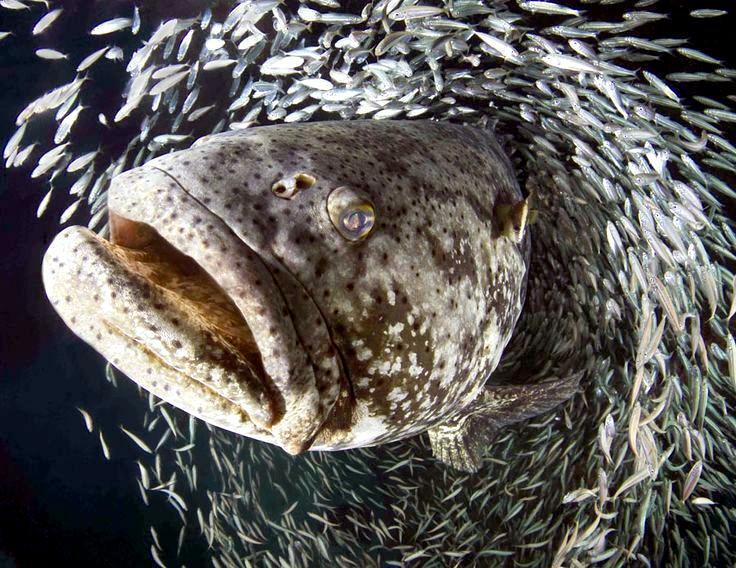 If there is no male in the group, the largest female will turn male to satisfy their reproductive needs. 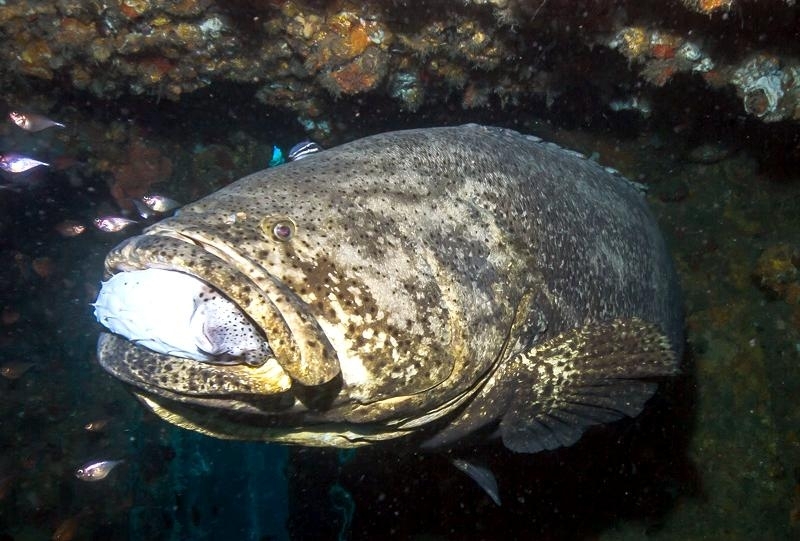 The Giant Grouper preys upon other sea life but rather than chasing after its prey, it prefers to lie in wait and catch any prey unaware. 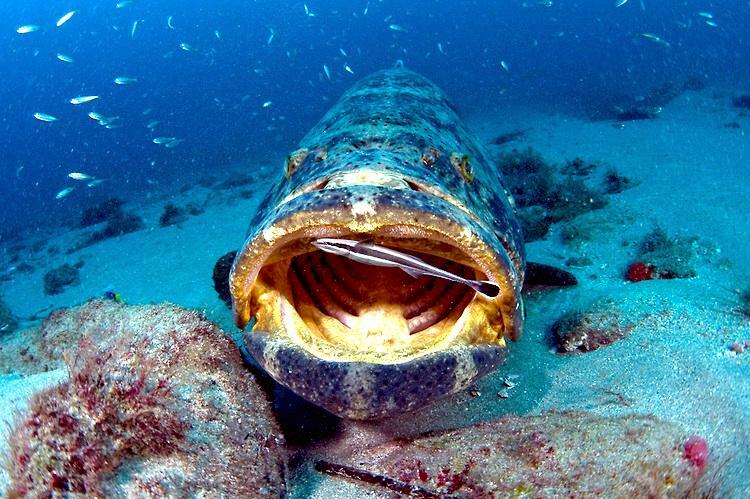 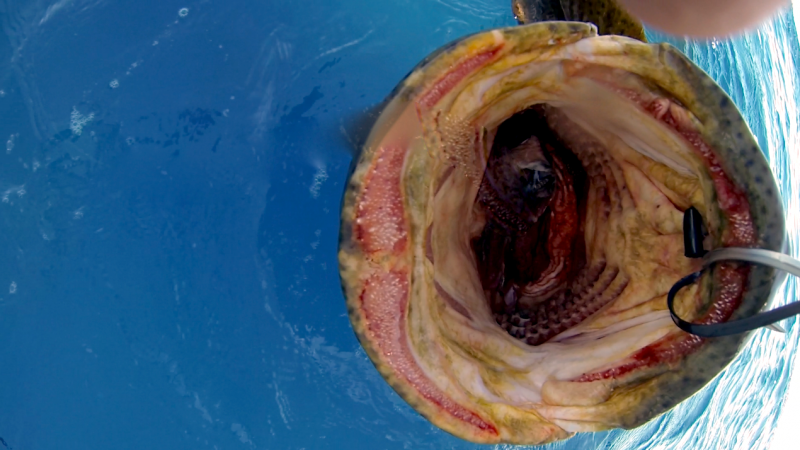 This slow-swimming, sluggish behavior isn’t good for them if there are spear fishermen around. 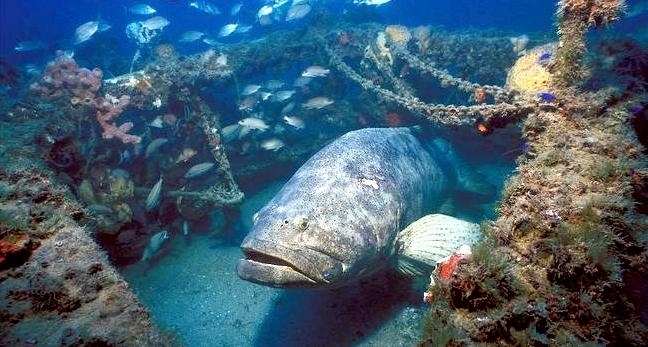 Another threat is that their habitat is being destroyed by excessive fishing and its prey being wiped out.